Home › Uncategorized › El Diablo Says Hola! I’ve just got back from a week of sun, sea, sand and Satan – and it was actually all rather refined. I went to Lanzarote with my mother and sister-in-law and on our first morning, when we went down for breakfast, I began to wonder if the hotel we’d checked into was some haven for occultists, because as I poured a glass of Prosecco (a perfectly acceptable thing to do while on holiday, ha!) to accompany my freshly baked croissant, I was surprised (and somewhat impressed) to see a big demon statue hovering over the scrambled egg and sausage counter. Complete with forked tail, he looked nothing like any holiday-esque dining room sculpture I’d ever seen before. 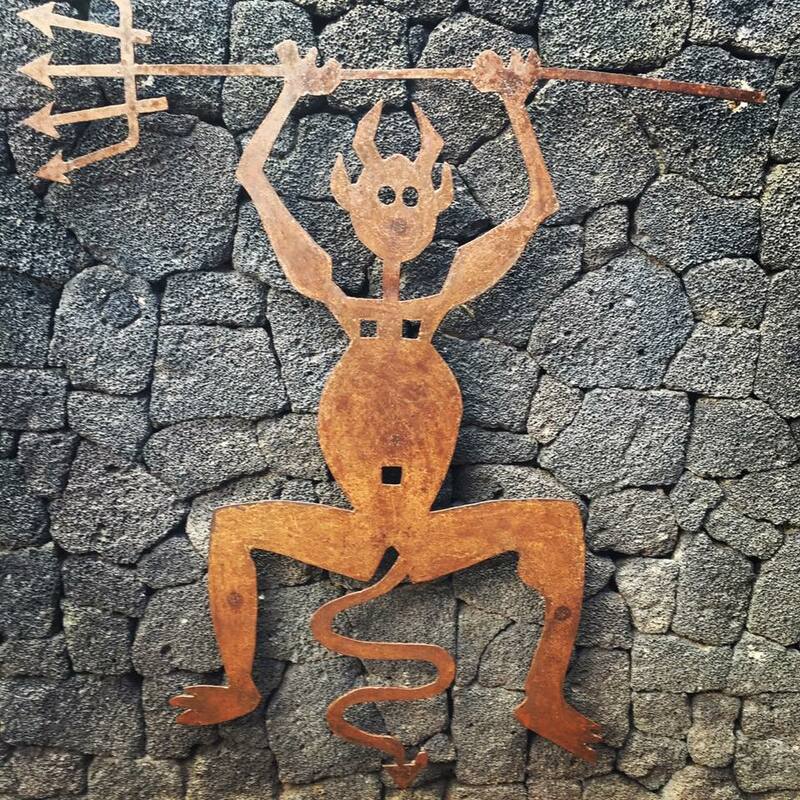 As it turned out, El Diablo is a bit of a mascot for Lanzarote (as designed by Canarian artist Cesar Manrique), and thankfully there were no weird sacrificial ceremonies, involving goats and chickens, to be undertaken by the hotel’s poolside animation team (although their overall presence did border on hellish at times). Now, me being me, I was delighted by the island’s quirky emblem. I mean, what better character to use to define a place so packed with active volcanoes than Old Nick himself? And the lava fields, wow. Travelling through Timanfaya National Park, we saw lots and lots of lava. From which we learned the beautiful, sparkly green mineral olivine is formed. Then from olivine, once polished and cut, at gem standard, there is peridot. So, of course, I had to get me some peridot to fetch home! Derek and I just found out we’ll be moving house very, very soon – cue, much stress! Boxing and de-cluttering is now well underway, and I’m continually amazed by how much ‘stuff’ we’ve hoarded over the years, including countless photographs (of when we were a lot thinner), a couple of laptops that don’t work, a manual for a car we no longer have, a collection of videos (!!!) and a bag of wolf’s hair (I kid you not). 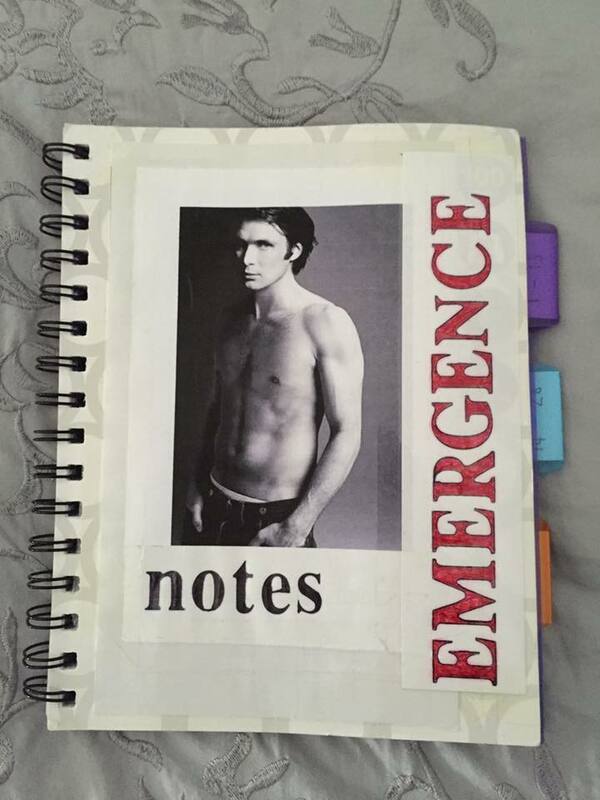 A notebook that I used for the planning stages of Emergence (and yep, Cillian Murphy was my inspiration behind John Gimmerick, if you didn’t already know). I’m not yet sure if it’s a keeper or a chucker – logically I know it’s served its purpose and should just go in the bin, but part of me is holding on – so it’s in the ‘undecided’ pile for now. What do you reckon? I’d like to thank everyone who’s read and reviewed Emergence so far, by the way – the support is very much appreciated! And this is why I love, love, love to hear from my readers! It reminds me of why I do what I do.